Customer will have to supply ice to use. We can deliver ice for additional charge, notes must be placed in comment section if you want us to supply ice . Don't forget cooler rental. 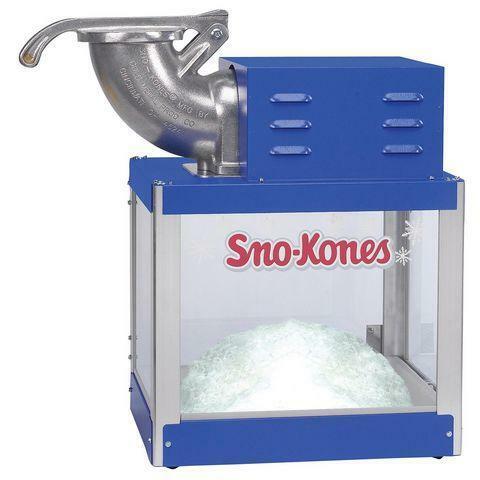 SNO-CONE MACHINE MACHINE OPERATION: Start the motor and fill the gooseneck with ice cubes or block ice broken into pieces 3” to 4” in size. Fill to about an inch from the top. The larger the ice chunks, the better the snow! Push the pusher handle down to press the ice against the cutter head. A firm even pressure is all that is required, but sometimes you will find it better to relieve the pressure two or three times on the way down. This lets the ice rearrange itself. DO NOT FORCE THE HANDLE!!!!! Too much pressure will stall the motor. When too much pressure is necessary, relieve the handle and the re-apply pressure. Too much pressure will cause the ice to come out coarse, too little pressure and the ice will be mushy. CAUTION: Do not let any metal get down into the gooseneck. It will ruin the blades. Never put any fingers or any object into the shaver body while the motor is running. Disregard for these instructions and careless handling can result in accidents and/or injury. If you experience any problems with this equipment, please cease operation and contact us at the number above. CLEANING Always unplug the machine before cleaning. Wipe all surfaces clean before returning equipment to avoid ADDITIONAL CLEANING CHARGES.